We look at the first group of backs in our mini-series. Their owners have nothing to worry about. So you want to rebuild via the draft? Part 4 of our Rookie Rebuilding series can help! Just how highly should David Johnson be valued? We take an extremely in-depth look at a startup draft, evaluating each round. We recap the magic, mayhem and mishaps from the weekend games. We take a closer look at tiered rankings of dynasty running backs and how to approach the position. 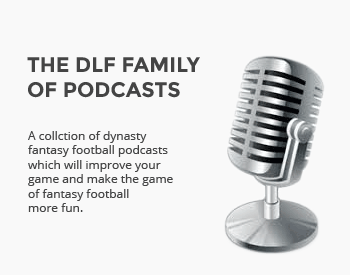 We polled the DLF writers on players being drafted in the second round. Who are the biggest risks? Who should you be looking to offload before the season kicks off? We offer out dynasty sells.